1. Move oven rack to lowest position; heat oven to 450�F. Fold wings across back of turkey so tips are touching. Rub both cavities lightly with salt and pepper. Tuck legs under band of skin at tail, or tie together with heavy string, then tie to tail. 2. On rack in shallow roasting pan, place turkey breast side up. Insert ovenproof meat thermometer so tip is in thickest part of inside thigh and does not touch bone. (Do not add water or cover turkey.) If possible, place turkey in oven with legs to the back of the oven so they are in the hottest part of oven. 3. Roast uncovered 2 hours 45 minutes to 3 hours 15 minutes, watching carefully. After roasting about 1 hour 30 minutes, wearing oven mitts that cover hands and wrists, place tent of foil loosely over turkey when it begins to turn golden. 4. 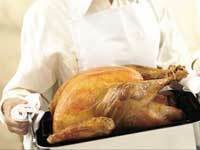 Turkey is done when thermometer reads 180�F and legs move easily when lifted or twisted. If meat thermometer is not used, begin testing for doneness after about 2 hours 15 minutes. When turkey is done, place on warm platter and cover with foil to keep warm. Let stand about 15 minutes for easiest carving.